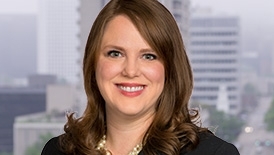 Julia Palmer is a trial lawyer whose state and federal litigation practice is nationwide in scope. 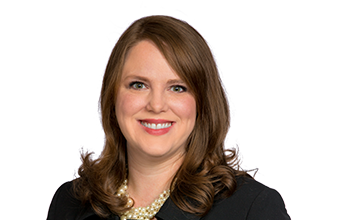 A large portion of her practice is devoted to defending product liability cases, including class actions, on behalf of automotive manufacturers and manufacturers of commercial and consumer products. She also acts as discovery counsel for a Fortune 10 automaker, working directly with engineers, investigating issues, interviewing company witnesses, and supervising the collection and production of large collections of documents using various electronic platforms. In addition, Julia regularly litigates business disputes and has experience navigating complex contractual issues. Throughout the course of her career, she has represented clients in cases encompassing the areas of professional liability, shareholder disputes, breach of fiduciary duty disputes, corporate governance, bankruptcy, franchise disputes, intellectual property, antitrust, mechanics and materialman liens, and fraud and RICO actions. Julia has also participated in large internal corporate investigations, prepared comprehensive audit reports, and counseled corporate boards of directors. She has expertise in discovery and ESI issues and the review and management tools available to minimize costs for clients involved in document-intensive discovery. Upon graduation from law school and before entering private practice, Julia served as a law clerk for the Honorable John Preston Bailey, Chief Judge of the U.S. District Court for the Northern District of West Virginia, for three years. Prior to joining McAfee & Taft, she worked as an associate with a boutique litigation firm in Atlanta, GA, and served on the faculty of the Kessler-Eidson Program for Trial Techniques at her alma mater, Emory University School of Law. Obtained dismissal with prejudice in favor of automotive manufacturer on product liability claims in multiple cases without settlement. Successfully argued for exclusion of plaintiff’s expert in federal automotive manufacturer product liability case. Successfully argued for exclusion of OSHA citations at trial in premises liability case against automotive manufacturer. Project management of massive, time sensitive, Court ordered document productions working with client, multiple law firms, and e-discovery vendors. Coordinated and supervised the collection and production of documents in four class action lawsuits filed against an automotive manufacturer. Successfully obtained summary judgment in excess of $4 million and discharge of improperly filed liens in favor of oil and gas company against vendor. Obtained favorable settlement in litigation related to alleged violation of purchase option in lease agreement. Obtained settlement in the amount of minority member’s contributions to LLC despite unfavorable terms in agreement. Obtained summary judgment in favor of medical product distributor on a $300 million breach of contract claim asserted against it by the manufacturer. Obtained favorable settlement in favor of minority shareholder in commercial construction business dispute prior to litigation. Obtained dismissal in favor of employer in federal lawsuit alleging that employer’s termination of employee was racially motivated. Obtained dismissal of state action alleging RICO and fraud claims against childcare franchisor. Obtained favorable settlement of state court action in favor of landlord alleging breach of commercial lease agreement by tenant. Obtained summary judgment and an award of attorneys’ fees and costs in favor of childcare franchisor against former franchisee for breach of franchise agreement. Obtained favorable settlement for corporation and former CEO in federal lawsuit alleging violation of state and federal securities laws, including Blue Sky and private offering requirements.